October 23, 1942: most of the soldiers of the Afrika Korp were already asleep in their dugouts. Then, at exactly 9:40 p.m., the quiet was pierced by the deafening sound of over 1,500 heavy British artillery guns opening fire in the fifty miles between the coast and the Qattar Depression. In the air, wave after wave of bombers of the Royal Air Force released their deadly cargoes over the German positions. It was the most massive blanket bombing since the First World War. A quarter of an hour later, the quiet returned. But before the veil of desert dust and smoke from the detonations could settle, the English infantry advanced to grapple with the enemy - the decisive battle of el-Alamein, the turning point of Rommel's African war, had begun. Nearly 200,000 troops, over a thousand tanks and 750 planes were available to the British - twice as many as the German-Italian forces could muster. The British troops commanded by General Bernard Montgomery were fresh and highly motivated. Their opponents, by contrast, were worn down and dispirited. Isolated cases of scurvy were already appearing in the German positions before el-Alamein. There was a shortage of ammunition, petrol and replacement parts. And the German troops also lacked the man who had led them to Africa: Erwin Rommel, the victor of Tobruk. Rommel was on "convalescent leave" in Europe. The battle was decided before it could really even be fought. No general of the Second World War has inspired people like Erwin Rommel. Because of his victories in North Africa, he was known to both sides as the "Desert Fox".Nazi ropaganda turned him into a legend that outlived the Third Reich that, until his death, he believed he was serving. Even today, the myth of the ingenious field commander of the Afrika Korps still appeals to both "friend" and "enemy". But the story of Hitler's youngest field marshal has developed cracks. He was a convinced Nazi, it is now said - not a man of the resistance movement, but rather a procrastinator who in the end preferred suicide to openly opposing Hitler. But at the zenith of his success his reputation was so great that, it was believed, he could take the place of entire divisions. In el-Alamein as well, Rommel's superiors wanted him to work his usual miracles and lead his troops to victory against overwhelming odds. During the night of the attack he departed for Africa, landing there within 24 hours. The Africa campaign was, after all, "his" war. But not even he was able to reverse the tide of events. When the British troops broke through the front at several places on November 2 and threatened to encircle large parts of his army, Rommel ordered a retreat. Hitler, who didn't learn about Rommel's decision until the next morning, sent a telegram urging him to "persist, don't yield a single step ...You must not show your troops any other way than to victory or death." 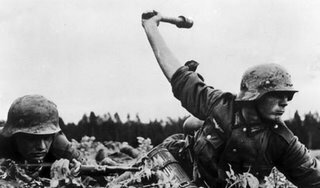 Rommel responded by immediately halting the retreat. But he knew better than anyone else that Hitler's unrelenting order to hold firm spelled the pointless death of tens of thousands and the end of his army. Eyewitnesses recall a scene in that night: feeling lonely and abandoned by everyone, the field marshal paced back and forth in the desert. Torn between his loyalty to Adolf Hitler and his compassion for his men, whom he didn't want to sacrifice to a useless order. It was the decisive turning point in the life of Erwin Rommel. On November 3, 1942 at el-Alamein, Rommel hesitated for 24 hours. Twenty-four hours in which thousands died horrible deaths in the glowing-hot sands of Egypt's desert. Then he finally acted, resisting Hitler's order. He placed life above obedience, thus saving most of the Afrika Korps. That evening Hitler grudgingly gave his approval. But his relationship with his "favorite general" was never to be the same again. The victory at el-Alamein, Churchill proudly declared shortly afterwards, was not yet the beginning of the end, but perhaps the end of the beginning: "Before Alamein we never had a victory. After Alamein we suffered no defeats," he wrote in his memoirs. The battle of el-Alamein was a turning point that led the end of Hitler's Reich. All that was left for Rommel to do was pull back to Tunisia. He himself was secretly fetched back to Germany, and it wasn't long before his army was forced to capitulate. Rommel's war in Africa took a toll of over 100,000 deaths.